This is the largest of the 3 mixing bowls, and nicely nestles the (8" medium mixing bowl item # 985) which nestles the (6" small mixing bowl item #984) for a wonderful 3 pc set. Mixing and matching patterns are encouraged! 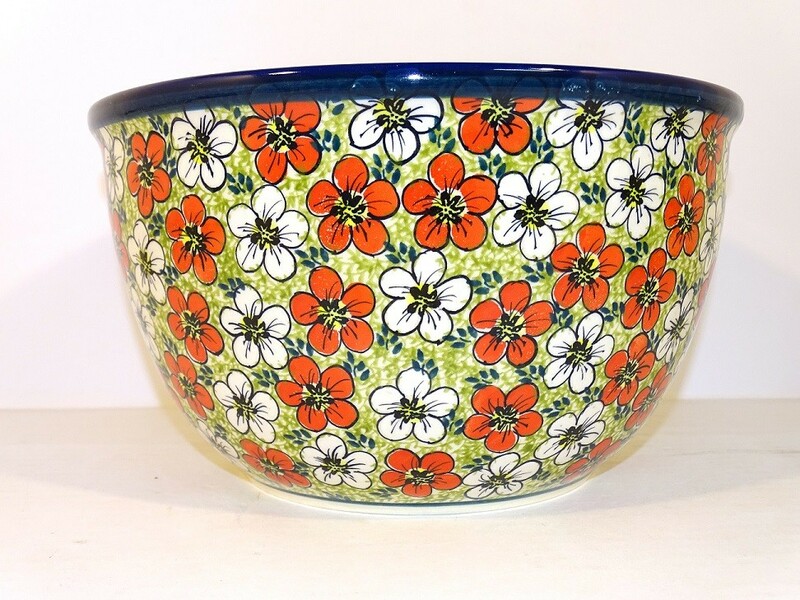 This larger bowl can be used for chips, popcorn and a serving bowl for salds and vegtable. These bowls make wonderful gifts. • Dimensions: Approx. 10.25" across x 5.75" tall holds • approx 14 cups to the brim. Polish Stoneware embodies art and function for everyday use, making mundane tasks more enjoyable with visual pleasure for everyone. A national treasure, Boleslawiec ceramics have been manufactured for centuries. Developed from natural ceramic clay that can be found near Boleslawiec at the Bobr and Kwisa rivers. According to historical sources, the first stoneware was made in medieval times and in the early 16th century, local potters formed guilds to ensure perfection. Zaklady Ceramiczne "BOLESLAWIEC" was founded by one of the original men with the first pattern dating back to 1759. “Red Bacopa10“ Mixing Bowl is a Unikat pattern based of the 300 year old pattern "EYE OF THE PEACOCK". Designed by top designers and imported by Pottery Avenue, the premier importer of Polish Pottery & Polish Stoneware. This largest of the mixing bowls. Nicely nestles the (8" medium mixing bowl item # 985) which nestles the (6" small mixing bowl item #984) for a wonderful 3 pc set. Mixing and matching patterns are encouraged! • Largest of a set of 3 nesting bowls • • This bowl is great for popcorn, and use the smaller nesting (#984) bowl for individual popcorn.